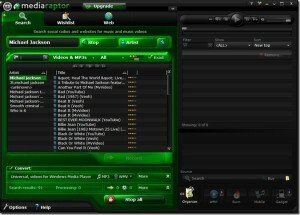 Mediaraptor is a simple solution for recording millions of songs from Web radio stations and music videos from the Internet. It’s common to Google out a song you just heard at a mall or on the radio. Searching in Mediaraptor might just yield the results you need. It provides you with millions of songs, videos and lyrics based on your search query. It has a simple User Interface with 3 tabs “Search”, “Wishlist” and “Web”. Filtering the results according to the type of content you want (audio or video) and according to the bit-rate of the media files is just a matter of few clicks. Mediaraptor supports keyword search as well as an alphabetical index that displays available video clip by the artist name with the source site tagged to the file. Everytime you watch a video or listen to a song on a website Mediaraptor records it for you. In case of embedded mp3 music on websites it can record the songs without playing them first.Mediaraptor lets you put the finishing touches on your collection with ID3 tags, album artwork and lyrics after recording your files. For staying upto date with the latest web radio stations you can add numerous search and record plug-ins . You can even add your favorite artists on the Wishlist and let the Mediaraptor fulfill the wishes whenever you want them to. It’ll download all the media content related to the artist and present it to you. You can compile several wishlists and switch between them. Mediaraptor saves all your wishlists automatically. Wishlists can even be imported from the community if at all you run out of ideas. The software comes with a media converter which lets you convert the downloaded files into a specified format. MP3 files can be converted to FLAC, M4A, OGG, WAV and WMA. And for the video files you can convert among AVI,3GP, MP4 and WMV formats. You can either burn your downloaded files or directly export them to your removable media device. Another feature that’ll leave the critics ogling is that it provides the facility to install in removable media storage device. If you don’t have internet at home, just install Mediaraptor in your pendrive and start downloading your files in the internet cafe.Unlike the other media grabbers Mediaraptor is not a P2P file sharing software. The long unbearable task of waiting for the peers to seed the file won’t ever be a problem with Mediaraptor. All in all Mediaraptor comes with a bundle of features to Download, Convert and Store the media files, thus making its title an apt one.